Bettas are generally easy pets to care for. But one of the most important parts of their care is making sure you’re using the right betta food. Let’s take a look at the best food available for betta fish and our reviews before getting to how to take care of betta fish. What Happens When You Overfeed a Betta Fish? How to Feed a Betta Fish While on Vacation? How Long Can Betta Fish Go Without Food? Aqueon Betta Pellets are perfectly balanced for your betta. They’re made with lots of real shrimp and whole fish meal made from salmon and herring so protein is a primary ingredient. These pellets are great for everyday feeding because they’re made with all natural ingredients and contain no artificial colors. The color of the pellets is the same color as the all-natural ingredients. They’re also just the right size to prevent overfeeding. Your fish will stay energized, have bright beautiful colors, and maintain a healthy, balanced life thanks to Aqueon. One of the things about these pellets from Hikari that makes them perfect for bettas is that the float. Since betta’s refer eating food on the surface, this floating pellet is more appetizing. It also allows you to closely monitor how much your fish has eaten which helps prevent overfeeding. Keeping uneaten food out of the water is important because it helps prevent water quality problems in the future. Plus, it saves you money in the long run because you’ll only use what you need. The first ingredient is fish meal, which is fish meat that’s been dehydrated and concentrated. In other words, it’s protein that really packs a punch. 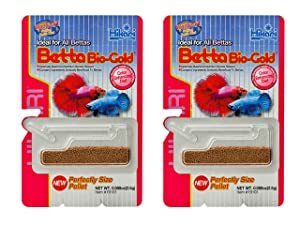 To promote a healthy immune system, these pellets also contain stabilized vitamin C. To help your betta’s color appear vibrant and to prevent fading, there are also natural enhancers. These pellets are really tiny and you should feed your betta 5 to 10 of them up to 3 times a day, depending on the size of your pet. 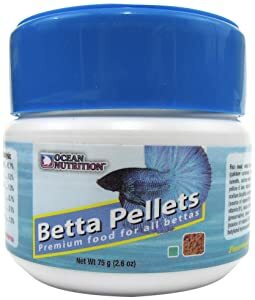 This floating pellet food from Ocean Nutrition delivers your betta’s food close to the surface, just how it likes it. This food is made up of 36% protein with minimal fillers and is balanced well to give betta the proper nutrition it needs. Plus, the natural ingredients will help enhance the color of betta without having any negative effects on the water. These are smaller sized pellets which is particularly good for bettas because they can be picky eaters. They’re much more likely to give a small pellet a try than a large one. Just place about 7 pellets on the surface of the water twice a day depending on how big betta is. Keep the unused portion in the bottle with the lid securely in place and the container will last 6 months after opening. 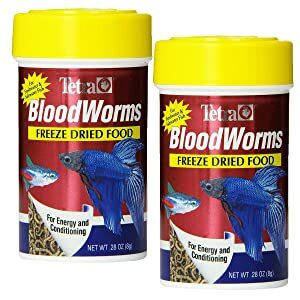 It’s important to remember that bettas eat insects in the wild, which is why these freeze-dried bloodworms from Tetra are such a great choice. They give your fish a huge protein boost in a great tasting little package. These are actual freeze-dried bloodworm larvae that will encourage your betta’s natural foraging instincts. Plus, they contain about 53% crude protein which is perfect for a supplement. These bloodworms shouldn’t be used as your betta’s only food. This is to be used more as a supplement to give them a treat and the protein that they might be missing. It’s also a great way to simulate how they’d really be eating in the wild where they would enjoy whatever they could catch. Remember, bettas are picky eats so if you’re concerned your fish isn’t eating enough or if you’ve switched daily foods and he’s just not into it yet, a protein supplement is a good idea. 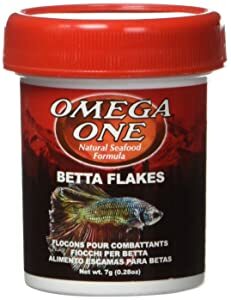 If you have a betta that prefers flakes to pellets, give this food from Omega One a try. The main ingredient in this food is salmon and the natural pigments present in the salmon skin help your betta keep a bright and vibrant color. The next 3 are herring, shrimp, and halibut. This isn’t only a protein-packed meal, it’s one that will taste really good to your bettas. Omega One also uses all natural protein binders that keep these flakes from disintegrating in water. That means that any leftover food will be easy to clean up and it won’t break down and change the chemistry of the water. These pellets from New Life Spectrum are packed with protein, including Antarctic krill, herring, squid, and mussels. All-natural ingredients have also been added to enhance and sustain your fish’s colors. While protein are the main ingredients, this food also includes algae meal as well as fruit and vegetable extracts to provide a well-rounded diet that includes all the essential vitamins and minerals. These pellets are a little larger at 1 mm each. They’re semi-floating and will stay toward the top of your tank then slowly start to fall to the bottom. 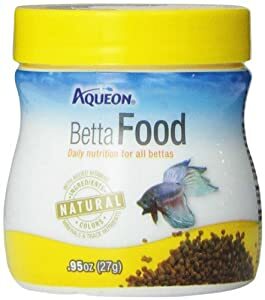 This food is really easy on your betta’s stomach so if you have a picky eater, give this food a try. The ingredients were all carefully chosen so they’re easy to digest and leave behind as little waste as possible to keep the water balanced and healthy. How much your betta should eat in one meal really depends on the size of your betta. One way to determine how much any betta should eat is to look at the size of its eyeball. Believe it or not, a betta’s eyeball is roughly the same size as it’s stomach. This is usually about 2 or 3 small pellets depending on how big your fish is. If you find pellets left behind, try cutting back a little on the amount that you give your fish with every meal. Another thing to try is soaking dry pellets in a little bit of water before placing them in the tank. This will prevent them from expanding so much inside your fish’s stomach and might help regulate its appetite. Bettas should be fed once or twice a day. Adult bettas can usually get by with one meal while babies or young fish who are still growing will need 2 meals a day. We’ve mentioned this before and will mention it again, but it’s very important not to overfeed your betta. If you’re going to be out of the house and will miss an evening feed, it’s better to skip it than to feed it twice as much in the morning. One of the main problems that overfeeding can cause is constipation. This is especially true if you’re using a low-quality food with a lot of fillers that tend to be more difficult for them to digest anyway. If you notice that your fish’s belly is a little distended, that he’s stopped making waste, or he’s lost his appetite, it’s likely constipation is the issue. Constipation can quickly evolve into something a little more serious, which is why it’s so important to avoid. If constipation is severe or prolonged, swim bladder disorder can develop. The swim bladder is a part of your fish’s body that allows him to swim up and down in the water. In simple terms, air fills or is released from the swim bladder to help your betta position itself in the tank. Constipation can prevent the swim bladder from working appropriately because the backed up food takes up too much room in the already small body of a betta. If you notice that your betta can no long swim upright, swim bladder disorder is likely the cause. One fix is to fast your betta until the blockage passes and the fish can regulate the swim bladder again. Some fish are just more prone to constipation. If you have this problem repeatedly, it’s a good idea to soak any pellet food in water for about 10 minutes before feeding it to your betta. This softens it before it enters the stomach and makes it easier to digest. There are actually quite a few things you can feed a betta in a pinch and you might already have some of them in your kitchen. Remember how small bettas are and keep their stomach size in mind if you choose to try any of these foods. A betta will eat small pieces of tuna or shrimp but make sure they’re very small and remove anything left uneaten. You can also feed your betta peas, one pea at a time. Cook it first and remove the shell. Then, cut the inside up into tiny pieces. Bettas eat insects in the wild so any kind of insect larvae makes a nice treat for them, too. In fact, you can even through a spider in the bowl every once in a while. Keep in mind that bettas can go a long time without eating so if you’ve run out of food, your fish will be alright waiting a day or two until you can get more. There are a few things you can do if you’re going on vacation and need to feed your betta. First, consider how long you’ll be gone. If you’re only going for a few nights or a long weekend, your betta will be okay until you get back. Any longer than that, though, and you’ll have to take action. The easiest thing to do is ask someone to pet sit. If you have betta in a bowl, you should clean it right before you go so you don’t have to worry about the water while you’re gone. You can either ask someone reliable to come to your house to feed it or just take the bowl to the house of someone you trust to feed it daily. Make sure you explain exactly how much food your betta should be getting and how often it should be fed. Having someone look after your pet is really the only option if you’re going to be gone more than one week. Another option is an automatic feeder. There are a lot of options available. The best kind is one that will let you program the specific times you want your fish to eat. Keep in mind that there’s no guarantee that these machines will be as accurate as they need to be. There’s a chance that they will overfeed or underfeed your betta while you’re away. One way to try to avoid this is to set the automatic feeder up a few days before you leave so you can make sure it’s functioning properly. That way, you can work out any issues before you go. Food blocks are another good option if you’re going to be away for less than a week but don’t want to leave you fish without any food. Food blocks are designed to float on the water and slowly dissolve to release small amounts of food at a time. They’re designed to last about 2 weeks but are meant to feed a whole aquarium. This will only work for a betta for a few days; any longer and you run the risk of too much feed being released and returning home to a constipated betta. Believe it or not, a betta can actually go about 14 days without eating, perhaps because they’ve had to learn to cope with dry seasons and limited food in the wild. That’s why if you have any concerns that you fish is eating too much, holding off food for a day or so is not a big deal. We’ve already talked about how to handle feeding your fish while you’re on vacation but knowing how long a betta can actually go without eating might put your mind at ease a little before taking a trip. It also shows you that it’s always better to underfeed than overfeed. Your betta will be fine for a while without food but too much at one time can cause all kinds of problems. There are actually a lot of reasons why your betta won’t eat. Some are easy to treat and some can be a little more serious and require immediate action. We’ll start with the basic things first. The first one is an easy fix. It’s possible that your fish just doesn’t like its food. Remember, they’re notoriously picky eaters. If you’ve recently switched food, it’s likely that you fish isn’t really into the changes. It could be that maybe you’ve gone from flakes to pellets or the other way around or maybe the flavor is off-putting. If your betta is no longer interested in its food, one of the easiest fixes is to try a higher quality recipe. More real protein might taste better and entice your fish to have an appetite again. Another thing that can ruin your betta’s appetite is stress. This is normal when you first bring your fish home before they become accustomed to the environment. If you’ve had your betta for a while but have recently changed to a different tank or added something new into the environment, your betta might take a day or two to get used to it. Things happening outside the tank can cause your fish stress, too. Covering the tank to give your betta a darker environment might help them calm down and acclimate better. Try to keep day and night cycles for you fish and cover the tank with a towel or sheet overnight if needed. But don’t leave it in the dark all the time. Fish need daylight as their active period and it’s actually when they’ll be most interested in food. Giving your fish too much food can cause problems that’s we’ve discussed previously. Lack of an appetite is one major sign of constipation. One way to prevent this from happening is to give your fish smaller amounts of higher quality food. Believe it or not, water temperature plays a big part in your fish’s appetite, too. Bettas are cold-blooded and need their water to be between 75 and 79 degrees F. Their metabolism and appetite are directly related to the temperature. If the tank is cold, everything slows down and they don’t require as much food. Check the water temperature and make the proper adjustments. Lastly, your betta might not be eating because it’s sick. It’s one of the most common symptoms of illness and one of the earliest. If you’ve tried everything else and nothing has helped, look for other symptoms, including lethargy, pale coloring, tucked in fins, distended stomach, or any parasites or fungi. See a vet if you notice any of these changes in your pet as they can be life-threatening. All of our picks are nutritionally formulated for bettas and will help them live their best life. 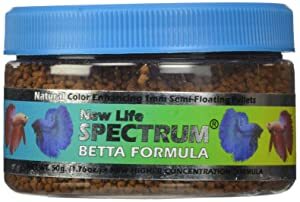 That said, our pick for the best quality betta food is the formula from New Life Spectrum. They’re full of protein, including krill, herring, squid, and muscles. We also really like that it includes natural fruits and vegetables like algae meal as well as things you’d find in your own kitchen, like zucchini, kiwi, tomato, and peas. These ingredients not only provide your betta with the nutrition it needs, they also help this recipe be easier to digest than other formulas that contain corn or wheat meal. If you have a picky eater, especially one that’s prone to constipation, this food is worth a shot. They’re semi-floating so they’ll hang out at the top of the tank to entice your fish to give them a try. The all natural ingredients taste great and are easy on your fish’s stomach. Finally, they were designed to leave behind as little waste as possible. So, whatever your fish doesn’t eat won’t break down and cause as many problems with the water chemistry as some other foods will. Sorry to say, but “fish meal” isn’t a good diet for a betta due to the fillers inside. The best food I found so far is Dennerle Betta Booster, Northfin Betta Bits and Fluval Bug Bits. Avoid OMEGA ONE, because it has BHA and BHT in it. I had three betta fish die from cancer after using that product. died from cancer? did you have an autopsy done after they died lol!